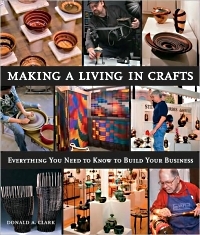 Artisans who want to turn their passion into profit need look no further: with a combination of inspiration and practical knowledge - plus hundreds of images - this comprehensive guide offers the most solid and current information on the crafting business. Artisans who want to turn their passion into profit need look no further: with a combination of inspiration and practical knowledge - plus hundreds of images - this comprehensive guide offers the most solid and current information on the crafting business. It goes way beyond just the crafts show: everything is covered, from developing a product to drafting a business plan, from marketing to exhibiting in galleries. Carrie Greenwald of South Dakota says, "This is the best of the artist books on how they and others have made it in the art world - successfully! It is inspirational and yet honest. Testimonies by other artists add interest, especially since they work in varied media. Tips on how to make it and yet develop a thick-skin for particular situations added to the usefulness in motivating any artist. The quality of the book is impressive, from the type of paper, images, and resources, making it a reference that I can use for many years to come." There are numerous interviews with prominent people throughout the industry, along with a discussion of craft economy as a whole and the challenges you might face along the way. Learn how to efficiently design your product, set up a studio, hire employees, and set prices. Crafters will appreciate the encouraging message on keeping one's creative spirit alive. T. Shafto of Kauai, HI says, "I highly recommend this book to anyone who is interested in making a living selling their creations. Mr. Clark provides a complete guide with the information neccessary to help artists reach their potential. From the basics of consignment to desirable ways to sell and market your crafts, he has thoughtfully included it all. By implementing what I've learned in this book, we are well on our way to making a living doing what we love to do, in less than a year! Thank you, Donald Clark!"